His saddle bag is a mixed one, though Pale Rider still has the touch of quality associated with latter-day Eastwood. 116 min. Warner Bros. Pictures Distribution. Director: Clint Eastwood. Cast: Clint Eastwood, Michael Moriarty, Carrie Snodgress, Christopher Penn, Richard Dysart. The Man With No Name or a pale rider named Death? With 1985's Pale Rider, Clint Eastwood returned to the saddle as actor-director after a nine-year absence from the Western genre. His saddle bag is a mixed one, though Pale Rider still has the touch of quality associated with latter-day Eastwood. If the film plays more like a Western refresher course for Eastwood (between more highly regarded outings), it's also an impeccably photographed film, with strong production design and use of locations. The simplistic story is essentially a straight rip from 1953's Shane. A small community—in this case miners and their families losing their faith in the Gold Rush—falls prey to a stronger force (the industrial hydraulic mining outfit run by Richard Dysart's dirty, no-good Coy LaHood). The community has a good man and a moral center (Michael Moriarty's Hull Barret), but needs a hero or, perhaps, a Savior. Enter a mysterious stranger (Eastwood's "Preacher") with the power to inspire and put fear into the hearts of evildoers (including John Russell, excellent as corrupt Marshall Stockburn). When his work is done here, Preacher can no longer tarry, but must ride off into the sunset. Working well within these simplistic parameters, Eastwood doesn't try to reinvent the wheel. The actors are believable, though only Hull's character satisfactorily develops (we wouldn't want "Preacher" to lose his mystery, but the other characters needn't be cardboard). Precisely because the script gives them too little to play, it's useful that Eastwood has evocative actors in the roles of Hull's live-in girlfriend/potential fiancée Sarah Wheeler (Carrie Snodgress) and her daughter Megan (Sydney Penny). Populating the rest of the supporting cast are familiar character actors ranging from Doug McGrath to Chris Penn to Richard "Jaws" Kiel. If anything elevates Pale Rider from a mere pastiche (however well crafted) of Western clichés, it's the subtly ambiguous treatment of Eastwood's character. One can read the film as a flat-footedly literal good-versus-evil oater, but Eastwood certainly invites viewers to regard "Preacher" as an avenging spirit returned to mete out Death to the man who killed him, with justice for the downtrodden a pleasing bonus. As star, Eastwood is potent and charismatic, and as director, he demonstrates the craft that would eventually win him an Oscar. Clint Eastwood is rapidly becoming the best-represented Hollywood talent on Blu-ray, largely thanks to Warner Home Video. 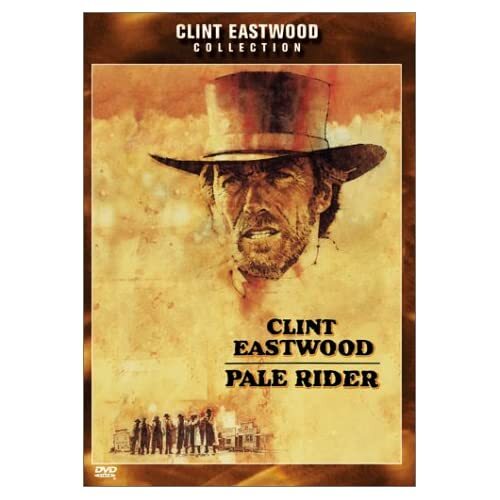 Warner's reissue of Pale Rider doesn't have a lot of bonus features: only the theatrical trailers for Pale Rider (1:12) and Unforgiven (1:55). But the most special of features here is a very handsome picture. Certainly there is no better way to watch Pale Rider in the comfort of your home: the image is natural, clean and detailed, with accurate tones and satisfying depth, and handles well the film's delicate interplay of sunlight and shadows. My only real complaint is that the picture suffers from bothersome horizontal jitter (someone needs to invent a digital tool to address this issue, still cropping up in film-to-digital transfers). The soundtrack has been cleaned up very nicely, and provided a Dolby TrueHD 5.1 surround mix that's crisp and (pardon the pun) soundly arranged. All site content © 2000-2019 Peter Canavese. Page generated at 04/21/2019 10:41:23AM.